It feels good to write about something besides Atlanta politics and politicians. A little of that goes a long way. Besides, the beauty of these poems go far in uplifting the spirit and involving the heart. And that can’t be bad. Komachi is one of my favorite poets. Briefly, she lived from 834?-??. It’s not clear when she died. 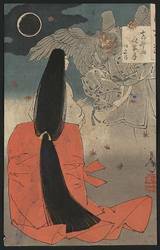 She served in Japan’s Heian court and was one of the dominant poetic geniuses. She is also in the great Man’yoshu, a collection of 4500 poems. She was also considered a classical beauty. Hair reaching to the floor, which was the style then, she was the daughter of the daimyo in the Dewa mountains, up in Akito, Japan (Northwest territory)sent to Kyoto to serve at court at 14 years of age. As a lady of the Heian court, she distinguished herself with her poetry and has quite of few in the great Man’yoshu, this 8th century document. Her poetry was seen as having great philosophical and emotional depth. That she was surrounded by other excellent poets, men and women of the court, certainly helped in developing her own. The form: these are written in tanka form…the usual form of poetry most popular. Don’t be put off by the lack of syllables or more than for the lines. These poems are translated into English and they don’t necessarily fit the form exactly. This entry was posted on November 7, 2018 at 3:02 pm and is filed under Uncategorized. You can follow any responses to this entry through the RSS 2.0 feed. You can skip to the end and leave a response. Pinging is currently not allowed.